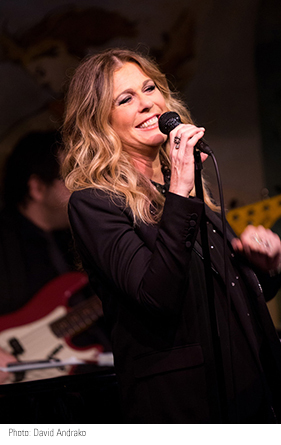 "I'm in a roomful of people I know," Rita Wilson began her intimate set at the Café Carlyle on Thursday. Though this was not opening night, the room took on an extra glow: on one side sat Michael J. Fox, on the other, Tom Brokaw, Carolina Herrera, Ken Auletta, Richard Cohen, and William Ivey Long who told me he dressed Wilson for her role as Roxy Hart in "Chicago." Sprinkling her songs with anecdotes involving her husband, she'd say, "Picture Tom Hanks," and you could see him trying to mollify a disgruntled guest at the hotel. Though she claimed he's the opposite of every thing she thought she wanted in a man, you could see he's the love of her life. Another refrain was the unforgettable title of her new album, "Rita Wilson." Wilson's songs, collaborations with a variety of songwriters, convey well-being, and sunny gratitude in the face of her 2015 health scare and, as she quips, surviving six months of Larry David when she worked with him on Broadway in "Fish in the Dark." Backed by her first-rate band, Steve Fekete on guitar and backup vocals, Lee Nadel on bass, Rob Mounsey on keys, and Rich Mercurio on drums, she sang "Say Yes," "Lucky Girl," "I Can't Make You Feel my Love," "Forgiving Me, Forgiving You," titles that suggest she's worked through her issues. Her botox song, "Can't Feel My Face," projects a Los Angeles ethos; in "Girl's Night In," she nodded to a corner table of women. She introduced her cover of "Angel in the Morning" informing the rapt audience that the songwriter, Chip Taylor, was Jon Voigt's brother and therefore Angelina Jolie's uncle who also wrote "Wild Thing." They did a little "Wild Thing." Her natural performance style is as comfortable as when you see her in the movies, or in HBO's "Girls." And you never know who'll show up at the legendary Carlyle during her residency. Speaking of which, a film about the Café Carlyle is Matthew Miele's next project. He told me so last week at the premiere of his tongue-in-cheek and informative movie on another legend's history, Crazy About Tiffany's. He's already tapped Tony-winner Lena Hall to be in it. She, like Rita Wilson, is someone I'll always look forward to seeing at the Carlyle.